With the legalization of recreational cannabis, and the introduction of the Cannabis Act and its Regulations, Licensed Producers are required to amend their product labels to adhere to new guidelines. 1. Standardized Cannabis Symbol – This red image is now mandatory on all cannabis products that contain more than 0.01% THC. 2. Lot Number – This number refers to the specific production lot and is used for tracking purposes in the unlikely event of a product recall. 3. 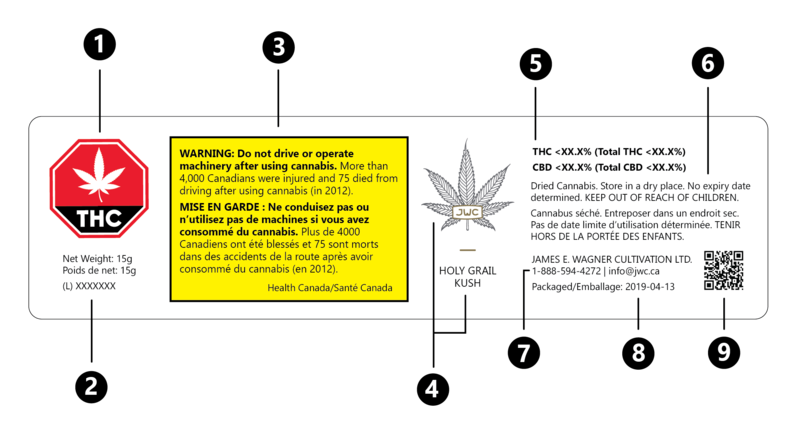 Warning Message - A yellow warning is now required on all cannabis packaging Health Canada mandates the messages that are included in this space. 4. Product Name and Branding – Here you will find the name of the strain you have purchased alongside our classic logo design. 5. Cannabinoid Content - The percentages listed on your medical cannabis show the THC and CBD content expressed as two different values. The first, smaller number represents the actual percentage of listed cannabinoids that are present in the product. The larger number expresses the potential cannabinoid content once the cannabis has been activated by heat, such as ignition or vaporization. 6. Cannabis Class & Storage Instructions – The cannabis class distinguishes the type of cannabis that you have purchased, for example, dried cannabis or cannabis oil. Adhering to our suggested storage instructions will help maintain the integrity of your cannabis product. 7. Contact Information – Our Client Care Team is available to answer any questions that you may have about our products or services. 8. Packaging Date – This shows the date that the material was packaged. 9. QR Code – This barcode is used for processing and tracking your order. The requirements of the Cannabis Act and its Regulations mean that patients are no longer required to prove their cannabis prescriptions if they are carrying less than the 30g recreational limit. As a result, you will notice that there is no longer any identifying patient information included on your JWC cannabis. As a medical patient, you are permitted to carry up to 30 times your daily prescription amount, to a maximum of 150g. If plan to carry an amount of cannabis greater than 30 grams, we recommend that you retain a copy of your Registration Document, issued to you by JWC, as proof of your prescription. If you require a copy of your Registration Document, please contact our Client Care Team at 1-888-594-4272, or at customerservice@jwc.ca. We also have a guide about travelling with your medical cannabis to ensure safe and comfortable travels. You can read our reference guide here.